This dress was made by Rachel from Silverlode Needlecraft… gorgeous. I am a huge fan of her spectacular work. She is quite the artist. Look at the detail…and this is one of her simpler dresses. The River Silverlode is my all-time favorite. It is like an incredibly complicated quilt! Unbelievable!! If it was mine, it would be hanging in a shadow-box frame in my living room. So what’s the reality check? On Dance-Again are scores of used, old dresses for $1600 on up. There are hundreds of worn BN dresses, cookie-cutter designs, priced ridiculously high because their owners want to recoup some of the price they originally paid. There are new ones made by experienced folks priced reasonably that do not get even a nibble. And there are so many brand new dresses made by inexperienced people that are priced unrealistically at $1200 -2000. Guess how much Rachel is asking for this dress, this gorgeous, one-of-a-kind dress made by a highly skilled, very experienced, accomplished dressmaking artist? Only $850…it is on Dance-Again for ONLY $850!!!!!! We all know that the ID dress market is changing. Rapidly. Used dresses now typically languish on sale sites for a very long time. I hear that the numbers of dancers are falling which affects sales. Styles change so fast that the perfectly good and beautiful dresses that were stylish 1 year ago are considered out-of-date…which affects sales. Even the re-sale market for the BNs is stalling because there is a glut of them. This is of course not the BN’s concern because the dresses belong to others, but as the BNs are increasingly being called out on their unfair business practices and dresses that cannot be danced in, I do believe that their future sales will also be affected if they haven’t been already. It is a rare dressmaker (any?) who makes a living from the sale of Off-the-Racks (OTRs) because there are so many dresses for sale. But there continues to be an influx of new dressmakers who seem to think there is high money to be had for their first few attempts. Do many of them actually get what they ask for? I have no way of knowing. So many of us encourage newbies all the time, because ID dressmaking should not be an elitist art form. But it takes time to become proficient, and the learning never ends. It is the weird pricing by the inexperienced that makes me twitch. Having made the journey myself from newbie to now, I know that my skills and therefore my dresses are INFINITELY better now…no way would I have asked $1800 for my 1st dress…or 2nd…or 3rd…you get it. On the ID dressmakers board, Celtic Flame, someone did take the time to ask about pricing and there was a great response: “If you are looking to build your name/reputation, then price on the low side of ‘reasonable’ to get your name out there. If you do this a few times with some great looking dresses, you’ll begin a ‘following’……” Great advice! I know I have done it. Another pricing issue…I have not really commented on this before, but I have had a big problem with the fact that the BNs were/are still charging BIG bucks for dresses that now have very little embroidery and/or appliqué. Quite frankly, it would be a breeze for me if I got to make a dress that depended mainly on the fancy fabrics for its “identity.” It would NOT cost as much as a dress dependent on embroidery and appliqué for it’s look. I have a breakdown of what I charge for everything…if there is little to no embroidery or appliqué, the price is significantly lower. In fact, this next solo will cost less because the underskirt will be completely soft! The one after that will have no stiffening anywhere which brings my labor cost down again!!!! But here, in Rachel’s dress, we have a skillfully designed, carefully constructed stiff dress with detailed embroidery and appliqué made by a well-known and respected dressmaker…and she is only asking $850. On her website, she states: “We were recently trying out a new skirt style** before beginning a dress for another dancer. It might have been overkill, but we designed a whole separate dress as our test dress with its own design and color scheme, and we are happy with the results and have decided to sell our finished ‘test dress’!” We should all be so lucky to make a “test” like Rachel’s! And, she is only asking $850!!!!! Does Rachel really think her work is only worth $850? I hope not. Or, is her (too low) price a reflection of an honest, realistic look at the current dress market? Perhaps this is something we should all be doing. I’m thinking she’s showing a bit of both of your suggestions. In her mind it was a “test/trial” and therefore not ‘worth’ the same as the perfected follow-up AND given the current market in ID dresses you would want to be lower than the competition to see it on a body and not under the bed! Agreed…but is it understood that her “test” is leagues beyond so many other dresses billed as finished? This change-a-happening is going to be interesting!!! I too am dumb founded by the dress marked at the moment. There is a huge glut created by the BN’s. I’ve only made 2 OTR’s. I don’t think there will be anymore – I’ll stick to a few custom orderes. I have a brand new dress sitting on DA for $500 which I cannot sell. Had a few nibbles, but nothing serious. There is one DM out there that I know of that makes successful OTR’s. I think her secret is sticking to a couple of set sizes and making them to the current style that the BN’s churn out. They are reasonablly priced in common ‘pretty’ colours nothing too out there, and seem to move quickly. Rarely see them reduced. Although very skilled and beautiful, this dress is not a reflection of the current “fashion”. I think she knows that. I also think that she makes dresses as part of her religion, a meditation and honor to her beliefs. my dd dress was made by a very experienced dm (thirty plus years)she charged £350, as she knew me i bought my own material and she had made my daughters first dress two years previously (£300)i went with my design and made a little mock up of the applique on the panel i wanted. she doesn’t own a computerised embriodery machine has an industrial singer. she has recently started charging more for her dresses i think about the £550 mark.i would pay more for a dress now that my daughter is in open. i love the perfection of computerised embroidery.$850 does seem low, yes it was a test dress but i assume a very well constructed test dress.her puff ball dress was beautiful. i personally would never book an airfare to ireland get my daughter measured by a bn then fly back again to collect the dress. (i have actually made the bodice of a dress for my daughter but lost confidence in my ability to finish it) the main reason being i am not experienced, i think of it as a hobby in my spare time, likewise i would never ask more than £150-£200 if i ever attempted to sell a dress and and the only reason for selling would be my dd can only wear one dress at a time and to re coup price of materials. but as i haven’t even finished the one i did start theres little chance of me selling anything. i also read something on a message board about new rules so it will be interesting to see how things go. I don’t know if I can claim to be practical or influenced by all the IDD comments on prices, but as a newbiew dressmaker, I’ve assumed I will not be able to even resell my first dress. Why? and if not, then why the heck am I making one? 2. My daughter is not “average” or “typical” in any way. She’s 12 yrs old novice (started dancing late), 5’9″, NOT rail thin and has no chest yet. And bless her, she has LONG legs and arms. This is not a common size and so few, if any, girls might fit her dress for repurchase, anyhow. So why make one? Well, I had this silly idea that I could do it and would enjoy spending the time and learning. HA! OMG have I learned! Nearly made myself sick trying to make my self-imposed deadline, had skirt and machine problems, and failed. I’m not enjoying this, but neither do I regret it. And my daughter certainly knows I am doing a lot for her. Also, frankly, I didn’t want to shell out $1200 for a used, mediocre dress, even if we’d found one to fit. I’ve spent much more than that in time, but time’s not cash even if it’s worth money. Your posts have not only helped answer my many, many newbie questions, but have also helped me keep perspective. If my DD outgrows this first dress before it can be worn (distinct possibility), I’ll put it for sale but probably for like $300 or so, just to get some of the material cost back. That’s what I assume Rachel’s doing–recouping her cost for material but nothing for her labor as she used it to learn. Great perspectives. You are right, C, that the dress is not a current design style even though it is a swoop, but have to admit that is what I like about her dresses. They are so unique. I had never heard about the dresses perhaps being part of her religious devotion…talk about zen! 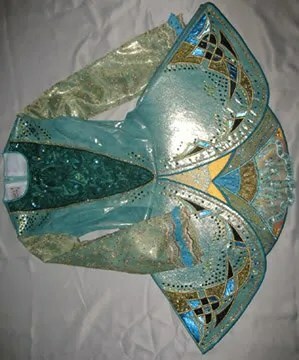 I LOVE all of the Silverlode dresses, but they are unusual and there are just too few parents willing to take the risk. It pains me to see the low price tag on such an intricate and throughtfully designed dress (won’t fit my dd but boy, have I considered buying it and putting it away for 2 yearsat that price! ), but I have yet to meet a parent who doesn’t say “It’s pretty, but I think I better stick with BN design.” What saddens me most is that we are encouraging conformity among our young women rather than individuality with our own anxieties as parents. I too love the silverlode dresses, and if I was going to get another dress made any time soon (not likely as I’m done growing! ), I would totally go for one of her works of art. I sometimes have to laugh at dresses that have been “discounted” for the last time to $1200, because a parent can’t stand to think that someone else wouldn’t spend that much money on a dress, and if she paid $3000, well, it’s a steal, isn’t it? Anyway, I hope it is a new trend that dresses are less expensive and make our art form more accessable to the rest of the world. I love the Silverlode dresses. Rachel is a true artist. The beauty is in the incredible detail work she does. They really confirm that ID dresses can be true pieces of art worthy of a gallery, to me–I only wish I could attain that level of artisty, myself. However, and this is a BIG however, I don’t think they show well on stage. Because she tends to go for the details and uses complimentary colours (and rarely any unusual fabrics), they tend to blend at a distance. What is a stunningly detailed and gorgeous dress up close can be a swamp of green (or blue, or pink) on stage, just as what is hideously garish and overwhelming up close can be quite striking and interesting on stage. Add into that the utter disregard for trends (something else I wish I had in me! ), and she has a very niche market to sell to. None of this negates the utter beauty of her work, mind. It does lessen her audience of likely buyers, though. I think Cari Buziak runs into the same problem: beautiful, detailed work that tends to be so detailed as to lose itself on stage. Also, $850? Madness! There is so much detail involved in her dresses they truly do deserve a very high asking price, trial run or not. I’m sure it will be snatched up quickly. If I’m ever rich, I want one just to have as an art piece in my house! I find this blog very enlightening. I have a somewhat set starting price, but I am in the process of finishing two OTR’s, both prototype in pattern and assembly. As they are, in fact, “experimental,” I had planned on asking a much lower cost. A couple of years back, a lower asking price on a new dress brought comments that it wasn’t as GOOD as a BN because it was inexpensive. Now, I think it means you just want the dress to sell.